George Zimmerman glances back at the gallery during a recess in his murder trial in Seminole Circuit Court June 17, 2013, in Sanford, Fla. According to Raw Story, the former neighborhood watchman responsible for the death of unarmed Florida teen Trayvon Martin in 2012 called the Armed American Radio show on Sunday to give fellow gun carriers advice about what to do if they ever happen to shoot someone. 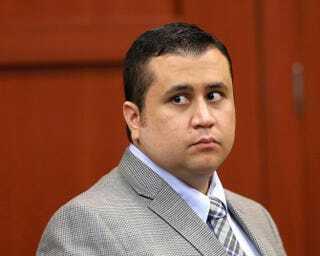 It seems that one of Zimmerman’s greatest regrets was not buying self-defense insurance for himself. He also pointed fingers at the media for not giving him a fair hearing after the incident and during his trial. “The media, they’re not in the business of telling the news, they’re—now, unfortunately, it’s evolved to them being in the business of making the news, and whether it costs people their lives, their livelihood, dignity, the position in the community—they could not care less,” Zimmerman said. It was the media, he said, that forced him to keep a low profile, and he encouraged gun carriers who may kill someone and claim self-defense to stay away from the media atogether. “Anything you say to them—and my family has learned this, my friends have learned this—people that truly had absolutely no malice intended would talk to the media and it would be turned, massaged to fit their agenda and completely distorted,” he said on the show. “There is absolutely no benefit to talking to the media. “I’ll tell you that I’m not working—I enjoyed working, I enjoyed being a productive, taxpaying member of society. I haven’t worked since the incident, so in terms of the violent threats, the bounty on my head, I haven’t seen on any of the bounty posters an expiration date,” the 31-year-old said.